The Livestock Emergency Guidelines and Standards (LEGS) Project is the result of concerns that interventions in emergencies often fail to support the livelihoods and resilience of pastoralists and other livestock keepers. The LEGS Handbook, which has been produced through wide consultation with practitioners and policy makers around the world, sets out standards and guidelines for livestock-based interventions in both rapid and slow-onset emergencies. It provides tools and guidance for participatory design and implementation of timely and appropriate livestock responses, covering key topics such as assessment, response identification, and technical areas including destocking, veterinary services, water, feed, shelter and restocking. Since the publication of the LEGS Handbook in 2009, the LEGS Project has developed training materials and rolled out a series of Training of Trainers courses in six developing regions. The Handbook has also been translated into French, Arabic and Spanish. As a result of the training programme, there are now over 120 LEGS Trainers in Africa and Asia, who are rolling out LEGS Training courses in their own countries. The LEGS Handbook and training programme have been well received and plans have been drawn up to expand the programme to additional regions, including North and Central Africa, the Middle East and China/Mongolia, and to translate the Handbook into three additional languages. The LEGS Project aims to continue to provide practical guidance for both field workers and decision makers to design and implement livelihood-based responses in support of pastoralists and other livestock keepers facing drought and other disasters. In the 1999 drought, Kenyan pastoralists lost more than 2 million sheep and goats, 900,000 cattle and 14,000 camels. This represents 30% of all small stock and cattle, and 18% of camel holdings among these pastoral communities. The drought also had a social impact: families separated, damaging the social networks which provide a safety net for pastoralists, and many moved to settlements and food distribution centres. Without sufficient livestock to provide for their food needs, many pastoralists became dependent on food aid. Once the drought ended, some could not return to the pastoralist sector because their livestock losses were too great and hence their livelihood had been destroyed (Aklilu and Wekesa 2002). The Livestock Emergency Guidelines and Standards (LEGS) Project grew out of growing concerns among livestock professionals about the quality, timing and appropriateness of livestock responses among pastoral and other livestock keeping communities in emergencies. These concerns included: the poor analytical basis for interventions; late delivery of response; the absence of impact assessment; and a failure to address livelihoods adequately in emergency response. The result is that local services and capacities are often undermined, leaving pastoral and other livestock keeping communities more vulnerable following the disaster. At an AU/IBAR-hosted international workshop in 2004, a multi-agency review of livestock interventions in complex emergencies identified the need for a set of internationally recognised guidelines for livestock interventions in emergencies, and the Feinstein International Center of Tufts University was given the task of taking the work forward. A Steering Group was established to manage the process, comprising individuals from: the African Union, the Feinstein International Center, the Food and Agriculture Organisation of the United Nations (FAO), the International Committee of the Red Cross (ICRC), and Vétérinaires Sans Frontières Europa, supported by an independent LEGS Coordinator. A global network of over 1,500 organisations and individuals was set up to facilitate consultation with a wide range of stakeholders. The first draft of the guidelines was placed on the LEGS website in June 2007 for comment and feedback. After revision, a second draft was made available for field testing and other practitioner review through simulation workshops. The LEGS Handbook was published in April 2009 as a hard copy book with accompanying CD-ROM, and is also available free of charge as a pdf download from the LEGS website. LEGS follows the format and process of Sphere, the Humanitarian Charter and Minimum Standards in Disaster Response, and has drawn on the lessons learned by Sphere, including the value of consulting a wide range of stakeholders to ensure the quality of the content and to increase ownership of the output; the involvement of both policy makers and practitioners; the linkages with human rights; and the independence from any single organisation, to help ensure a wide uptake and acceptance. LEGS is in the process of receiving formal companion module status with Sphere. What is LEGS and what does it contain? The LEGS handbook is a set of international guidelines and standards for the assessment, design, implementation and evaluation of livestock interventions to assist people affected by humanitarian crises. It focuses on the importance of protecting and rebuilding livestock as a key livelihood asset in emergency and post-emergency situations. These include rapid onset disasters such as floods and earthquakes, and slow onset emergencies such as drought, as well as complex disasters such as those affecting many pastoralists and other livestock-keeping communities in the Horn and East Africa and elsewhere in the developing world. In the context of more predictable emergencies such as drought, it includes the promotion of preparedness and contingency planning as well as emergency response itself. The LEGS handbook begins with a discussion of the role of livestock in livelihoods and the importance of addressing livestock as a key livelihood asset for pastoralist and other communities. Drawing on the Drought Cycle Management model developed in the pastoral areas of East Africa, LEGS has developed a tool to assist in the identification of appropriate, timely and feasible livestock interventions in emergency contexts, setting them against three livelihoods-based objectives - the Participatory Response Identification Matrix (PRIM). Figure 1 shows an example of a completed PRIM for a drought in East Africa. Example of a completed PRIM for a drought in East Africa. The Participatory Response Identification Matrix (PRIM) is a tool that uses assessment findings to facilitate discussions with local stakeholders in order to identify which interventions are most appropriate, feasible and timely, in the context of protecting and rebuilding livelihood assets. It should be completed using assessment results by a group of stakeholders including community representatives. There is no 'correct' PRIM as the results vary with context. This is an example of a completed PRIM for a drought in East Africa. Like the Sphere handbook, LEGS contains minimum standards, key indicators and guidance notes. LEGS focuses on six key livestock interventions: destocking, veterinary services, provision of feed, provision of water, livestock shelter and settlement, and restocking/the provision of livestock. In addition to the standards and guidance notes, each chapter contains an analysis of the advantages and disadvantages of the various options within each intervention, discussion of the most appropriate timing for the intervention, and a decision tree which raises some of the key issues to be considered during the planning phase. The technical chapters are preceded by a chapter of standards common to all interventions, such as participation, monitoring and evaluation, coordination and assessment. What is the LEGS Project doing now? Following the publication of the LEGS Handbook, the LEGS Project embarked on a post-publication phase, which includes the translation of the handbook into French, Spanish and Arabic (now completed and available as free pdf documents on the LEGS website: http://www.livestock-emergency.net); the promotion and development of impact assessment tools using LEGS; evaluation and feedback on the LEGS handbook to feed into a revised edition in due course; the development of training materials based on the LEGS handbook; and the roll-out of a programme of training of trainers (TOT) courses in developing regions. The training programme is based on a cascade effect, whereby LEGS Trainers are recruited and trained through regional TOT courses, and then become a resource for LEGS training in their own countries. The current phase of TOTs, which is now drawing to an end, comprised seven courses in the following regions: the Horn/East Africa, South-East Asia, South Asia, Southern Africa, francophone West Africa and Pakistan/Afghanistan. The LEGS Handbook has been well received, with over 2000 copies sold in the first 8 months, leading to a reprint by the publishers, Practical Action Publishing, in addition to the distribution of 1,500 free copies. Around 200 copies of the pdf version of the Handbook are downloaded from the LEGS website each month. A revision of the Handbook is planned for 2012. The seven TOTs carried out to-date include two in the Horn and East Africa, where demand for the training has been particularly high because of the importance of pastoralism and the prevalence of drought in the region. Participants include staff from international organisations such as FAO, NGO staff, local government officials and independent consultants. Together they form a resource of trainers who can be commissioned by interested organisations to carry out the basic 3-day LEGS training module in their region. Thus far the TOTs have been very positively received and each TOT receives more applicants than places. In the Horn and East Africa region, over 200 applications were received for 24 places. The course evaluations have reflected the perceived usefulness of both the LEGS handbook and the training itself - see Figure 2. 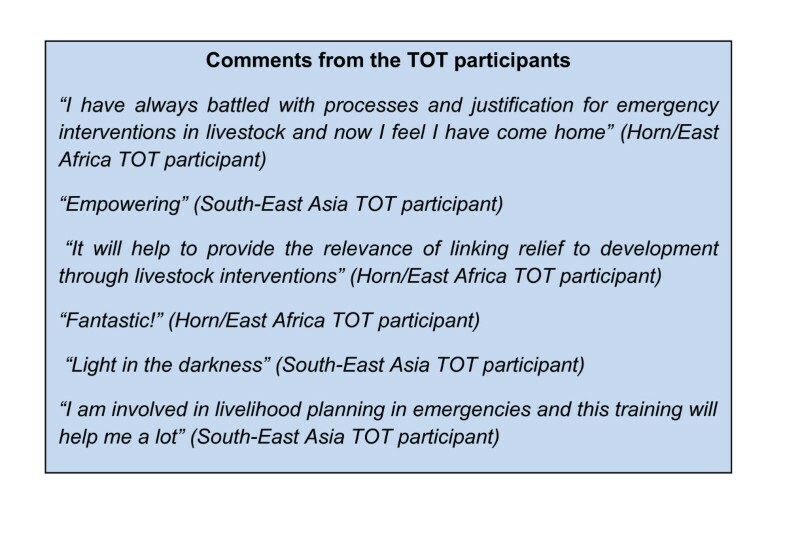 The LEGS website Training Page http://www.livestock-emergency.net/legs-training/index.html contains summaries of all the TOT evaluations. As a result of these seven TOTs, there are now 124 LEGS Trainers in Africa and Asia, who have begun rolling out LEGS training (21 courses to-date), reaching over 450 participants in nine countries. A half-day training and awareness module on LEGS was developed for policy makers and donor representatives and has been delivered to various agencies in Nairobi, Brussels, London and Rome. This module will be further rolled out in the forthcoming phase. Organisations such as FAO and ECHO are actively promoting the use of LEGS by their partners in the region when submitting and appraising proposals. A number of NGOs in Ethiopia now use LEGS as their key guideline in designing and implementing their emergency interventions in pastoral areas. The government of Ethiopia has produced a set of national guidelines for drought response in pastoral areas, which was developed in tandem with LEGS and which complements LEGS by providing context-specific guidance for livestock-based responses. A consortium of NGOs working on the USAID-funded Pastoral Livelihoods Initiative programme in Ethiopia recently made the use and implementation of LEGS one of their strategic priorities in working with pastoral communities in order to achieve their goal of 'increased resilience to shocks and secure more sustainable livelihoods'. Funds are now being sought for the second phase of LEGS training in 2011/12, including TOTs in North Africa, Central Africa, anglophone West Africa, Mongolia/China, the Middle East, Latin America, the Caribbean, North America and Europe; as well as the further roll-out of the half-day module for policy makers and donor representatives, and translation of the LEGS handbook into a further three languages. The LEGS Project is also interested in continuing to collect case studies, experiences of implementing LEGS in the field, and impact assessment and analysis, to provide a growing resource of relevant information to practitioners and policy makers engaged in livestock responses in emergencies. The LEGS Project aims to continue to raise the level of debate among implementers and decision makers involved in emergency planning and response, particularly with regard to the role of livestock in supporting livelihoods-based interventions in disaster response among pastoralist and other livestock keeping communities. The LEGS Project gratefully acknowledges financial and in-kind support from: Office for Foreign Disaster Assistance, USAID; Oxfam GB; Food and Agriculture Organisation of the United Nations; International Committee for the Red Cross; African Union; Feinstein International Center, Tufts University; Vétérinaires Sans Frontières Belgium; VETAID; Vetwork UK; UK Department for International Development (DFID); the Humanitarian Aid department of the European Commission (ECHO); and Trócaire; with administrative and technical support from Tufts University and overall coordination by Vetwork UK. This article was written by Cathy Watson, who has been the Coordinator of the LEGS Project since its inception in 2006.